The drive down to Nelsonville was slower than normal because of the snow, but by the time I considered turning around I was halfway there. And, I figured that on the way back the roads would be clear and so I continued on to Nelsonville. When I pulled into the lot I saw Rick's car and then Andrew pulled in. Just three this year, and Pete and Marty didn't make it either, which was a bummer. In 2010, the temperature was 13 degrees for most of the ride and we stopped midway to Athens in Eclipse and had brunch at Jana's because everybody was cold. For the 2011 edition of HATTARICK, I planned for the weather. I decided to add another layer over my wind proof bibs and I ended up having a double chamois. I wore wool socks under my neoprene boots and used hand warmers in my gloves. Up top I wore two thin layers, my winter jacket and added a rain jacket that would keep in the heat and turn the inside of the jacket into a rain forest. (see pics) I borrowed a second balaclava from Rick. The trail was snow covered from Nelsonville to Athens and the temperature made the snow pliable without any ruts from walkers. In the Eclipse area the damage from the tornadoes in the fall were evident from the sheared trees (see pics) and the damage to Jana's which forced them to close. Another restaurant across the street recently closed as well. As we traveled down the trail in Athens two bald eagles and a flock of geese flew over, including two albino geese. Rick decided to ride the hill on campus that turned out to be 19% grade. For lunch we ate at Casa Nueva with Andrew's daughter. The ingredients are all locally sourced and seasonal. Great food and service. Before heading out of town we stopped at Cycle Path to look around. The ride back on the trail was more of a chore because of the headwind. The addition of the Nokian studded tires helped out tremendously. Rick slid off the trail at least 7 times and had a spill at an intersection . 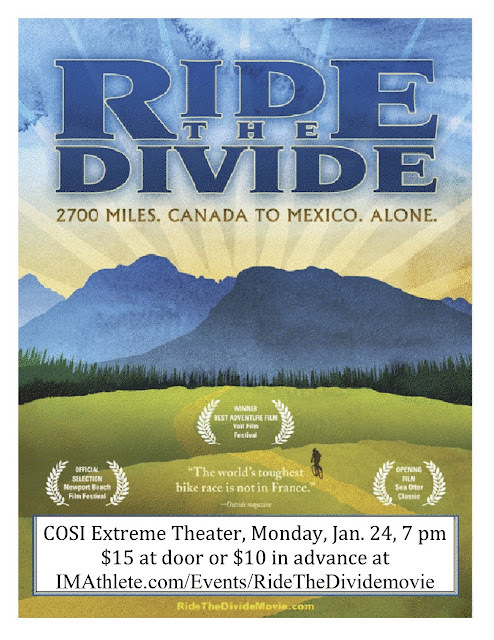 Ride The Divide, the award-winning feature-length documentary about the world’s toughest mountain bike race, will kick off a Midwest mid-winter tour when it premieres in Columbus on Monday, January 24, at the COSI Extreme Screen Theater. The film chronicles the story of several mountain bikers who attempt the 2,711-mile race named the Tour Divide along the Continental Divide in the Rocky Mountains. The movie was named the Best Adventure Film at the 2010 Vail Film Festival. This film has become an instant cycling classic, and made its television premiere in September on the Documentary Channel. But the Adventure Cycling Association said the film should be seen on the big screen: “The cinematography is stunning!” Nowhere will it be more stunning than on COSI’s 7-story-tall extreme screen. Ride The Divide will be shown at 7 p.m. at the COSI Columbus facility located at 333 West Broad St. in Columbus. 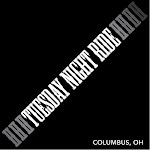 Tickets are $15 at the door, and $10 in advance at www.IMAthlete.com/Events/RideTheDividemovie. Bike Source is the presenting sponsor for the event. The 11-day, 11-city tour continues Wednesday night at the Capitol Theatre in Cleveland at 7 p.m., followed by Thursday night at the Neon in Dayton at 7:30 p.m. Riding around town has always been the right thing to do. Thanks to bikes like these, now it's also the cool--and fun--thing to do. 22.2 Greenway Trails shall remain open at all times to allow commuting and transportation uses. Persons shall not operate motorized vehicles including electric personal assistive mobility devices on Greenway trails, except Park employees or emergency service personnel in the performance of their official duties or except as necessary for transportation by persons with disabilities. I verified this with Larry Peck, Deputy Director, and he responded that I should share this with other cyclists. Only the trails (not the parks) are open to commuter/transportation cyclists off hours. I believe that this rule went into effect on August 1, 2010, and I’m sorry that it wasn’t publicized more widely. Did anyone else know? I am so impressed with the Metroparks willingness to accommodate cyclists and their responsiveness to our suggestions. 22.4 All traffic signs shall be obeyed, and control and reasonable speed for the amount of traffic, weather conditions, trail design, and other factors shall be maintained by Persons using bicycles, rollerblades, rollerskates, and similar forms of locomotion. Such Persons shall yield right of way to pedestrians and an audible warning must be sounded when passing other trail users. 18.2 Trail Regulations Persons shall obey all traffic control signs, lane markings, devices, and posted operational policies on trails. Larry asked that cyclists please follow the “reasonable speed” rule for the conditions, and obey all traffic signs and posted policies. I had been requesting that this topic be added to the agenda of the T&PC bicycle subcommittee, and it sure would have been more productive if Metroparks representatives (and Columbus Recreation & Parks, and MORPC and other organizations) were on the committee. Brent Nimmo, if you want to ride Alum Creek trail after hours, you have Metroparks blessing. All, please spread the word to other cyclists. Ten years, can you believe that? I didn't think so. But hey, who would make something like that up? For this year's HATTARICK, milestone 10 and all... we should do something special. I'm thinking.... How about temperature's above 30 dF !!! Geesh, was last year cold or what?? There must have been 15 people said they were definitely riding.... six showed up. One for each degree above zero. Certainly, those six degrees separated these riders far from the rest of the maddening crowd. to it's loyal riders, most of whom are nursing bad headaches that day. Why double up? 9:15 - 9:45 AM Arrive at Hocking Technical College Parking Lot, in Nelsonville, OH – Across the RR tracks from all those quaint log cabins. This is a social ride, not a race. And if temps are in the single digits again, it's not even all that social. Spoken words freeze mid-air, and can't pierce 3 layers of ear protection. We save up the banter for the restaurant, and take it out on the waitress. - which got subverted in 2010, cause when we first arrived at the quaint, salt-lick town of Enterprise, and the daytime high had reached a balmy 11 dF, and some idiot shouted "keep going! ", which no-one heard through their ear protection, and the first rider, following the muffled sound, made a right turn into Enterprise, and all the remaining riders followed. Later the 'idiot' was identified as an employee at the really nice, locally owned, healthy food restaurant, which means this person was a lot smarter than he/she sounded... but that's another story. Again, the PLAN is to turn around in Athens and ride back to Enterprise, and eat there ! 1. That makes the first half of the ride longer, the second half short, and screws up the concept of "half". Totally in keeping with the HATTARICK rider's renegade image. 2. Some may want to ride to Enterprise, stop and drink coffee, until the rest return. 3. Some may want to ride to Enterprise, stop and warn the restaurant about the rest of us, soon to be there. 4. Some may want to eat in Athens anyway, and skip Enterprise. Totally in keeping with the HATTARICK rider's renegade image. 11:40 ish Reverse direction, head for Enterprise. 12:10 ish Stop to eat in Enterprise... Dutch treat. HATTARICK riders are found in that small loop created by the intersection of those people crazy about cycling, and those who are just plain nuts. Come and see what Outside magazine calls "A mistake. Seriously, this is a big mistake. And NO, we're not sending a reporter!" that features an octogenarian rider wearing flip flops, and an Arc'Teryx MT. EVEREST Expedition parka, Sherpa series. See you Saturday, January 8. Please forward to the cyclists I missed or overlooked in this initial memo. So you'll have to split the case of SPAM and the carton of Lucky Strikes among you. 1. The town is called Eclipse, not Enterprise. Tricky, cause there is a town called Enterprise in that area too!! 2. The "really nice, locally owned, healthy food restaurant" restaurant is actually called Jana's. Except it got eclipsed by the recent tornado in that area. Several people said it's not now a functioning enterprise. BUT, someone suggested we go back to the OLD, OLD plan, and try: "the Casa Nueva in Athens" half-way thru the ride. So, the choice of restaurant will be 'up for grabs', once we arrive in Athens, assuming we arrive. The rest of the ride details: Where, when, parking, etc. remain the same. COLUMBUS, Ohio — For many people losing weight is at the top of their New Year's resolution list. But many will abandon that plan by February, so as we celebrate the 10th anniversary of Commit to be Fit, we show you a man who is literally half the size he used to be, 10TV's Andrea Cambern reported on Monday. As the head of Central Ohio Crime Stoppers, Kevin Miles is a larger-than-life crusader determined to clean up the streets of Columbus. The Long Street Tour's “Bike the C-Bus” is a fun way to get fit and check out a few of the neighborhoods in and around Columbus. Experience segments of the King Lincoln District, Woodland Park, Olde Town East, Downtown, Short North Arts District, Italian Village, Harrison West, Victorian Village, Arena District, Franklinton, Brewery District and German Village. The entire ride will cover approximately 30 miles over 4 segments andwill feature stops that highlight change that is occurring in our neighborhoods. Each stop will be sponsored by businesses and community groups and provide snacks, drinks and entertainment for the riders. The ride is configured to allow cyclists to complete segments if they do not feel comfortable riding the entire route. The registration fee ($25 before August 1, 2011, $30 after) includes an official 2011 “Long Street Tour” t-shirt (if you register by August 1) and wristband along with drinks and food at designated rest stops, plus a free lunch at the hospitality tent. Bike the C-Bus is the region's premier cycling event celebrating design, health, fitness, and urban lifestyles. “Bike the C-Bus” is considered a ride and not a race and will offer a variety of course options to accommodate everyone from recreational riders to hard-core fitness enthusiasts. Contrary to what most people think, the revolution in personal mobility did not begin with the automobile. It started about two decades before Henry Ford’s first Model T, and it was based on a combination of the electric railway and the safety bicycle. Electric streetcars and interurbans brought affordable, fast and frequent rail service to and between cities - - every American city or town with more than 5000 people had at least one streetcar line. The interurbans also tied towns and the countryside to the cities. The safety bicycle - - a bicycle with equal-sized wheels that was easy to mount - - was the first bicycle women and less athletic men could ride. It provided greatly enhanced local mobility compared to walking. Together, electric railways and safety bicycles offered the middle and working classes the level of mobility previously reserved to those wealthy enough to afford a carriage. This finish is a great choice if you are on a tight budget, want more color options than powder coating offers or you just want your bike a single color. The single stage polyurethane enamel is tough as nails (they paint semi’s with this stuff). No clear coat, just epoxy primer and paint. Simple as that. This is our standard high quality finish. We start by removing the previous finish, either by chemical stripping or light media blasting. Then on to a self-etching primer for protection, then a surfacer to prepare the way for the base coat. After sanding the primer, your bike is now ready for the base color of your choice and any artwork you may have dreamed up. Next we lay the first coat of clear and then sand it to ensure that the final layer of clear is the tastiest it can be. *Specialty paints such as Candies and Pearls are available for an extra charge. *A 50% deposit is required to start work. Lots of other good options, just ask! -We use all PPG and House of Kolor paints. -We only take completely disassembled bikes. We want your frames and forks. If you’re in the Columbus, Ohio area and need someone to do this for you, contact B1 Bicycles; they will take great care of you. -If you are shipping us your frame, please pack it in a box that we can use again otherwise we’ll have to charge you for a new one, let’s save some cardboard! I purchased this pump from Performance Bike in 2007. I also have a Silca Pista pump, but the gauge was never accurate and it needed to be rebuilt (still needs to be rebuilt) so I looked at the Joe Blow Pro which seemed well built and was a mid priced model at $60. The gauge is at the top of the pump and very easy to read. Base is wide to stand on even with one foot. The locking ring at the top of the pump loosens and loses air (very easily fixed by tightening, but still can be a nuisance when it sounds like your tire is leaking). The SmartHead is nice because you don't worry about switching any parts to pump Schrader or Presta valves. But, after three years the head basically stopped working and caused me to lose air pressure on the tire and without a backup would have been stuck. The good news is the entire hose assembly can be replaced simply by unscrewing the nut where it connects to the metal body. I happened to stop by Performance Bike and asked if someone could look at the pump because I thought maybe I was overlooking something. They promptly replaced the pump with a new Topeak Joe Blow Pro. The only difference I see is the new SmartHead is using a steel insert instead of a brass insert. Outstanding performance and super durability make JoeBlow™Pro a great seller. Perfect for shop or home use. Take a closer look at the BUSHTREKKA and you will find a product that has been developed specifically for bicycle touring. The trailer frame itself has features that set it apart from any other trailer on the market. Take for example the pivoting wheelset. By utilising two wheels under each side of the trailer, harnessed to a pivoting rocker frame, the trailer can easily absorb most of the uneven terrain in its environment. Additional to this, each set of wheels operates independently of the other, creating a clutter free underbelly on the trailer. By adjusting the positioning of each pivot frame vertically, the ride height of the unit can be adjusted for bikes from 20" up to 29". Storage is also at a maximum for this trailer. By using every piece of available space, we've created three main storage compartments with over 41 gallons (180 litres) of storage. Easy access at all times, even when set up, ensures you have what you need, when you need it. Our trailer also features fully adjustable levelling jacks to ensure no matter what terrain your setting up on, the unit can be presented to a horizontal position for sleeping comfort. Couple the trailer with the remarkable features of the Oversize or Original Tentcot and you are seriously set to travel. The TentCot conventienly folds away atop the trailer with its own waterproof cover to suit. There is nothing else quite like this trailer. It is the bicycle tourists best companion.